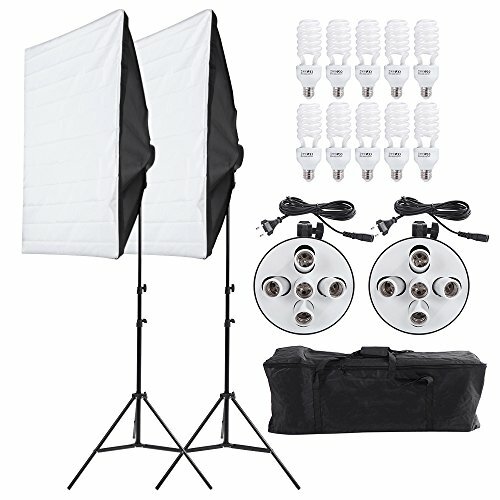 This set includes the softboxes, light holders, bulbs, tripod stand and carrying bag. 50 * 70cm / 20* 27in soft boxes to soften light stream and remove shadow for you. 5in1 light socket to provide better light for you and adjust the brightness according to your needs. 45W light bulbs to provide optimum illumination with 5500K color temperature. Adjustable high quality aluminum alloy light stand, max height of 2m, to suit your needs better. Size: 50 * 70cm / 20 * 27in. 【10Pcs 45W Energy Saving Light Bulbs】10Pcs 45W Super Bright Pure White Light Daylight Bulbs, 5500K Color Temperature, CRI 80+. 【2Pcs 50x70cm Softbox】2Pcs 50x70cm Softbox to Soften the Light Stream and Remove Shadow. 【2Pcs 5in1 Light Socket】5in1 bulb sockets, 5 control switches, each switch is used to control only one light bulbs. 【Application】The kit is perfect for portraits, costumes, products and so on. Ultimate soften light stream and remove shadow to make perfect shooting.